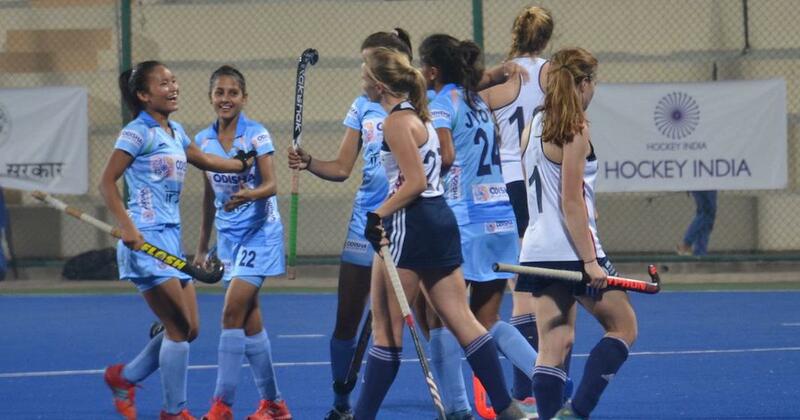 India A defeated France A 2-0 in their third match to stage a comeback in the series after losing the first game. The India ‘A’ women’s hockey team defeated France ‘A’ women’s team 2-0 in the third match at the Padma Shri Mohammad Shahid Synthetic Hockey Stadium in Lucknow on Tuesday. The hosts were helped by goals from Mumtaz Khan and Sharmila Devi, the duo scoring two well crafted field goals to give their team another victory in the four match series. The match saw the visitors dominate in the opening minutes, but the Indian defence made sure that they did not allow their opposition to score the first goal. With two goal-less quarters having passed, it was India who broke the dead-lock in the 42nd minute. Lucknow’s very own young striker Mumtaz Khan registered her name on the score-sheet as she produced a very calm finish under pressure to give her team a 1-0 lead. The French had several chances in the matches, but could not get past India’s goal-keeper Bichu Devi Kharibam. Some reflex saves from the Indian shot-stopper meant that India took their lead into the last quarter. An eventful last quarter saw both teams vie for the next goal of the match, but eventually it was India ‘A’ women’s team who were successful in their pursuit as they scored another field goal in the last minute of the match to extend their lead to 2-0, and take the third match. The India ‘A’ women’s team will play their fourth and last match against France on Wednesday.